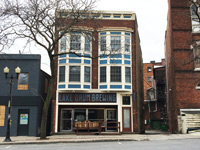 The brewery is located in downtown Geneva, close to the Lake. The inside is cool with nice woodwork, and the outside has a small on-street seating area. The IPA and APA were standard citrus-hopped brews, nothing too special. The owner was nice and wiped the outdoor table off for us. The bartender was super rude and just stared at us when we came up to order a beer. The owner came out after about an hour and told us that we couldn't have glass outside and tried to take away the beers we were still drinking. The vibe was snooty and the beer was okay. I don't think we'll be back. of the other beers really stuck out. What really impressed me was their cider. They had really great cider that I enjoyed and I'm not a huge cider guy. They definitely have room for improvement but overall not a bad stop. Visited just after opening at 3pm on a Friday. Only one other person showed up while we were there, and when I started asking questions, the bartender gave us a quick tour of the place which was cool. Apparently they get busy late at night since they stay open later than other craft beer places. 7 ciders on tap and 9 beers (including 2 nitro). Only 3 of the beers were Lake Drum with the other being from 3-4 other local breweries. What a great place in Geneva. Very good little bar with seriously dedicated taps to local beers (7) and ciders (6). Interesting beers that can feature lacto and brett. Guest beers and ciders are well chosen. Bar staff knows there stuff, and is very friendly as well as very helpful and educational. Josh was great. Back area has plenty of tables and seats. Shuffleboard and what looks like all the books that were never returned to the library. Take home beers are available in large and small growlers as well as pint mason jars. But extra kudos for the sound system that features old school vinyl and a great eclectic mix of tunes. Boy...you could settle in here and not want to ever leave.